The genesis of this late-late season fixture (30th September) was cancellations earlier in the month by Reading University and Brill, both through lack of players. The former have done this to us very occasionally over the years, but it’s a worrying first time failure from Brill. Happily, Whitchurch, who are my local side, were happy to fill the gap. Knowing the balance of the sides, I negotiated a bowl-first toss (those who know me will realise that this is pretty much my default position whatever) and just for the hell of it, opened the bowling myself. Captain’s privilege. The pitch, which is also the Village Green, is used by the general public when we’re not there, so inconsistencies in bounce are part of the normal routine. That’s useful for the bowlers who otherwise have to defend very short boundaries both sides of the wicket. It’s in a very pretty location, but it’s one petite cricket ground. Anyway, Whitchurch got off to a steady if not spectacular start. By the halfway stage (18 overs) they were about 90 for 1 and nobody really dominating. Riyas – my ringer to make up the numbers – finished his first spell of four overs for 16 runs, which is right enough. But brought on to bowl out the final two overs, he suffered a mauling at the hands of a Whitchurch Big Gun (and also a best mate) to finish with none for 50. That’s captain’s privilege again, you see, as I didn’t get to finish my spell for just this kind of reason. Other than that, all the bowlers (which included everyone in the side, this being the last match of the season) produced respectable figures with none standing out especially. Martin was particularly unlucky not to get a wicket, but Danny Forman, Paul McIntyre and Gary had one each to add to the season’s average. 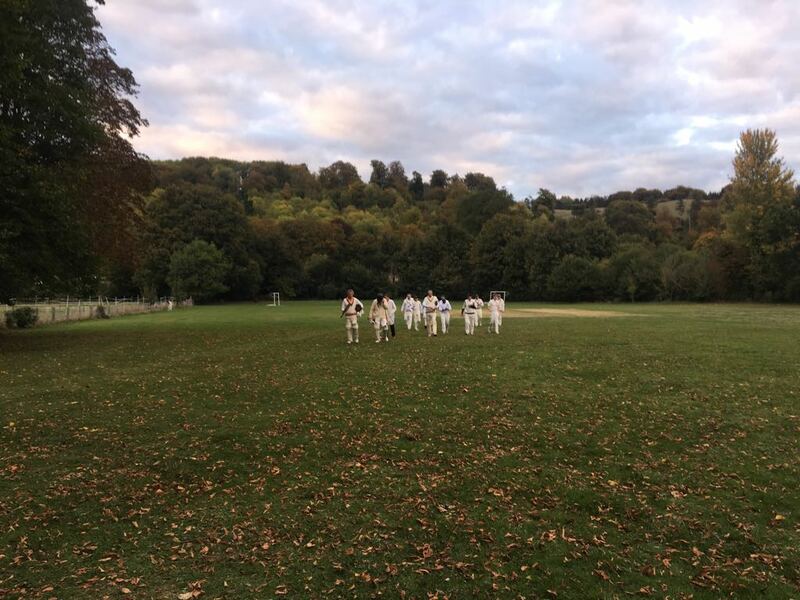 With a dramatic acceleration towards the end (two balls were lost, which is not uncommon here) Whitchurch reached 236 – 3. So, this being an overs thrash, the batting – now reinforced by Jonathan Wilmot, who was late by arrangement following a late withdrawal – had it all to do. But we’ve scored this before, and it wasn’t quite out of sight I thought. We started well, Chris Baker clattering boundaries with abandon, supported well by Arvind (26) for the first wicket. But after about a dozen overs, when I really thought we might just be in this, Chris, on 38 at the time, ran himself out going for an impossible single. Such a shame, it’s what the crowd had turned up for! Jonathan played a couple of delicious drives through the covers but then missed one. Gary got an unlucky low bounce, and this led onto a decent spell of scoring based around Drew Somerville's 50 and double-digit contributions from Riyas (19), Tivey (10) and yours-truly (14*). 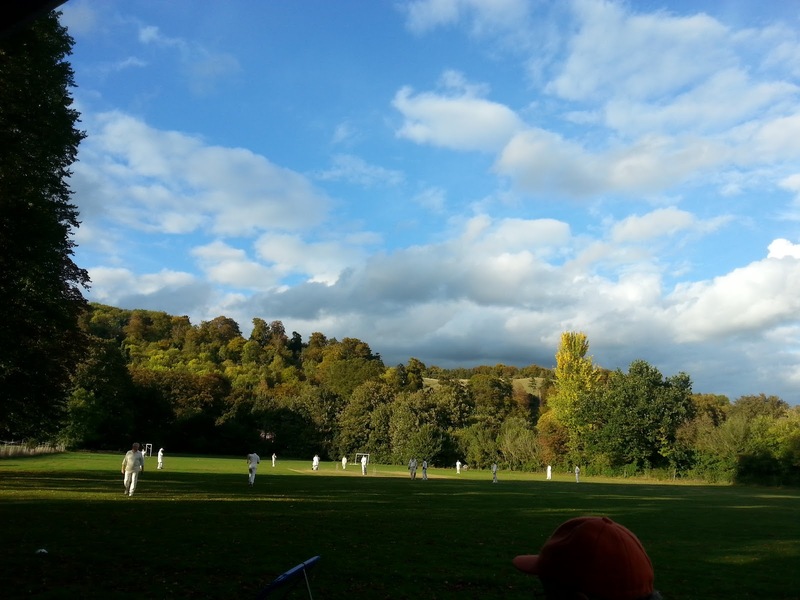 With a certain pleasing symmetry, I had faced the very first ball of the Mandarins season back in April at Peper Harrow (that one, I left outside the off stump) and the very last ball of the season, from which I made a boundary that edged us past 200 and a defeat by a convincing but respectable 34 runs. We took a few beers down at The Greyhound (real ale, low beams) with the opposition, and the evening came upon us at the end of another season.